The colourful characters of the Pathfinder Roleplaying Game's Inner Sea setting come alive on your tabletop with this box-busting collection of more than 200 character pawns for use with the Pathfinder Roleplaying Game or any tabletop fantasy RPG. Printed on sturdy cardstock, each pawn contains a beautiful full-colour image of a specialized character from one of the diverse nations and cultures of the Inner Sea region. Each cardboard pawn slots into a size-appropriate plastic base, making it easy to mix with traditional metal or plastic miniatures. 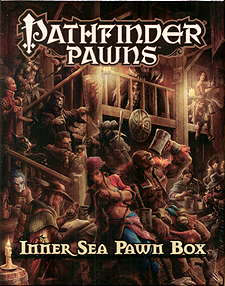 With multiple pawns for common character types and over 200 distinct character images, the Inner Sea Pawn Box is the best way to ensure you've got the perfect foes to make your Pathfinder campaign deadlier than ever.